Now that your child is about to complete Primary School, you are faced with the difficult decision of choosing the Post Primary School that will best suit your and his/her needs over the next five/six years. Many factors will influence your decision: - distance from school, transport, subject choice, school environment, facilities, staff, fees (hidden or otherwise), uniform etc. 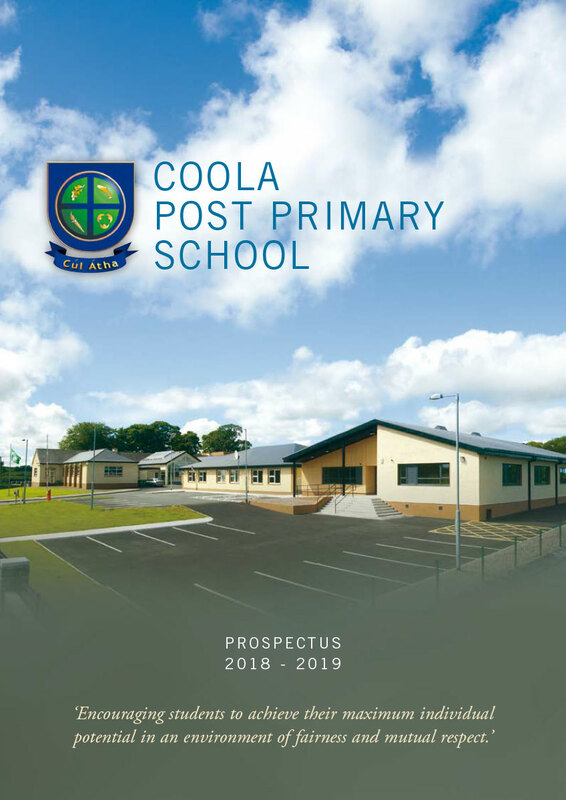 In our prospectus, I am putting forward Coola Post Primary for your consideration. In Coola, we strive for excellence in everything from academic achievement to extra-curricular activities. Students experience a welcoming inclusive environment in which they are encouraged to maximise their full potential. We provide an educational environment that is always carefully controlled and monitored but, is at the same time, understanding and caring, devoted to ensuring the personal development and welfare of each individual student. At Coola, one of the important factors to be considered is our rural location and the fact that children are on the campus all day under constant supervision and away from the many distractions/influences that exist around larger town schools. Our increasing enrolment over the past seventeen years has enabled the curriculum to develop and expand to one that is equal to all modern schools. The success of our students in State Examinations is exemplary. Results achieved by our students are consistently above the national average. Our transfer to third level is exceptional with many of our students obtaining scholarships to leading Universities such as Trinity College Dublin and UCD. If you enrol your child in Coola Post Primary, you will be entrusting him/her to a school with a tradition that is proud of its past and confident for its future, and from which he/she will eventually graduate as a young adult fit to take his/her due place in society.